In high school I had the absolute privilege of receiving a whopping 3 megapixel Olympus camera with a 16 megabyte memory card as a christmas gift. My parents saw that I loved photography and sprung for this little gem of a camera. Little did I know this little bundle of glass and circuitry would inspire and take me on such great journeys as it has. Photographic Details: I didn’t have any fancy equipment so I did the very best with what I could. I knew I needed a black background for the look I wanted. I took one of my moms nice black jackets and set it up outside as the background and floor of the shoot. I had no flashes, bounces, fancy lenses or anything else besides my camera. Instead of lights I used the bright overcast sky outside and a wide open aperture of f1.8. This let in enough light for me to shoot at the fastest shutter speed available on this camera, 1/800th of a second. I then poured water into the martini glass and shot as many photos as possible, freezing the action. In addition I took photos of a toothpick olive, and various streams of water. After selecting my favourite photos of each stream of water I brought the images into paint shop pro. I don’t think it had any masking features but I used the eraser tool to delete the background. I then replaced the background with solid black and added a touch of highlights, combining each item on a layer to get the final image! I want to prove to you that fancy equipment wasn’t necessary 11 years ago and isn’t now. Even though this image does have many flaws and isn’t fully up to my standards, my brother used the image in one of his marketing assignments and got an A! Toronto, Ontario Some of the first long exposures I’ve ever taken! I did this while in photography school in 2005. Photographic Details: Sneaking into a courtyard with these interesting sculptures I tried out the light drawing aspect of light painting. Here I would use an LED light to physically trace the outline of these objects, manually painting every stroke of light that you see on the tree trunk and sparkling structure in the background. I wanted to make it look surreal, as if the structure in the background was overflowing with energy. This is actually multiple 30 second exposures mashed together to combine into one ultra long exposure, with a minimum of image noise. Because I was wearing dark clothes and moving a lot, my body becomes invisible in the long exposure and only the light from the flashlight shows up! Other things like the colour and bubbles were added in photoshop. 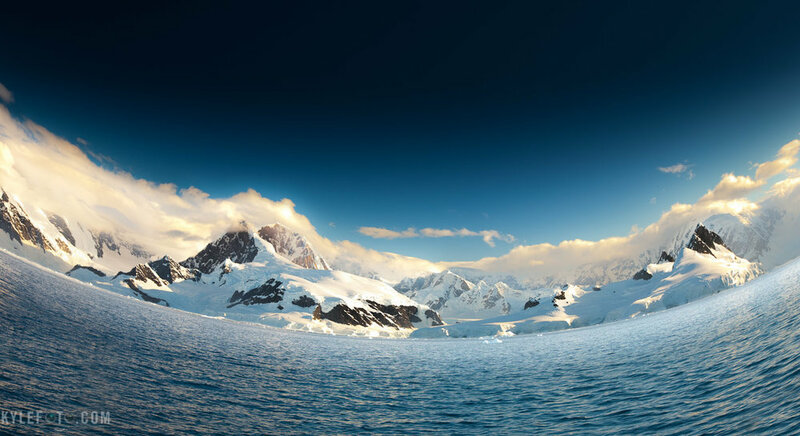 Antarctica The views that welcome you when you first arrive along the Antarctic continent is quite the sight to behold. Being surrounded by these tall icy figures rising out of the ocean feels like the mountains are hugging you, and despite the cool the antarctic air I always feel warm and fuzzy. This is one of the images I used to promote my Polar Worlds show. Photographic Details: Fisheye photos are cool but to use one regularly would be somewhat disorientating. The original shot had a flat horizon but I wanted something a little more dynamic. So instead of going out to get a fisheye I thought I would make the effect myself, turns out it’s possible in photoshop in about 7 clicks of the mouse! Open the image and double click your layer to rename it, you need to rename it to anything but “background” to unlock it for editing. Click on the middle of the image and drag your mouse down to begin warping, try it in other ways to get different results. When you are finished, press enter, and you are done! Canon EOS 5D, 1/100s f/5.0 ISO50 35mm 16-35mm f2.8 L lens. If you like this, please share. And if you try this technique, post it in the comments and share, let’s see what you can do! Svalbard, Norwegian Arctic Left on the sea ice from a polar bear that we could just see on the horizon in Svalbard. This is going to be a much rarer sight as the extent of sea ice is diminished every year, which is the important platform polar bears need to hunt for seals. The fact that the bear has left his prints on the very surface that it depends on creates a very powerful narrative about the problem these animals face today. Looking for a unique approach to polar bear photography I saw these tracks I knew this would help complete my polar bear portfolio as nobody really shares photos like these. So much about these animals is written in the snow: The long hair around the paws of the bear have brushed the surface of the snow and left streaks in exquisite detail, illustrating how the bear seems to shuffle across the ice. They can walk at great speeds on the ice but have to be careful not to overheat given the relative warmth of the Arctic summer and their great adaptations in conserving heat. The wide spread of the 12 inch paws act like natural snowshoes keeping the bear above the surface for optimal arctic travelling. Photographic details: Taken with a 400mm lens shooting downwards from the bow of the ship as we parked ourselves in this ice flow. The tracks were actually barely visible with the naked eye given the flat light. I had to open the raw file and darken down the image considerably to get more detail out of the image. The results were far more detailed than I could have ever seen in real life, making for an image that actually captures the drama behind these animals. Put people in your landscapes Too often photographers go to great lengths to ensure there are no people in their photographs. This is often something difficult to do especially when on holidays and in touristy places. I was trudging along the shoreline in Antarctica, scattered with beached pieces of ice berg left by the waves and tides when I came upon this lovely scene. It was missing something, and I was alone, so I decided this was a good job for the 10 second timer on my camera. I stuffed my tripod into the snow, ran into the landscape as far as I could, and did my best to “look into the scene” in time for the shutter to release. Running back and forth was actually pretty good exercise, and pretty fun! I encourage you to try this environmental self portrait in your next sunset or interesting landscape shot, I’d love to see them if you do! Technical facts: It’s important to note, on my particular lens (Canon 16-35 f2.8 L) and many other lenses, that when I stop down to f/16 I get a beautiful star shape out of bright objects like the sun. The number of aperture blades employed in the lens determines how many points you see in the star, even more reason to go with the “sunny f/16 “ rule! This is a blog post originally posted on http://www.kylefoto.com, if you like this be sure to check out the Antarctic Worlds Gallery here! The better Picture: Photographers take terrible photos too, they are not meant to be seen but are integral in getting a better picture. You have been out on Safari all day, taking hundreds of photos. Earlier in the morning you happened to have gotten a photo of a secretary bird and now you have been presented with your umpteenth viewing of this very bird; this is an important moment. Now you could put your camera down or instead you could set up your camera in preparation for the decisive moment that might become your ultimate secretary bird photo and perhaps even your best photo of the entire safari. The thought process I described above is classic example and is exactly what happened with the secretary birds. Some people were excited by my first shot of the birds and by all means, technically speaking you could say that I executed the image correctly; I gave the bird room to look into the frame, used a wide open aperture with only the bird in focus and no background distractions were in site. Due to the wide open aperture my background was softened and there was no accidental motion blur. Yay!.... Oh Wait, then why is it so blah? The bird is just standing there, nothing else is going on in the scene, that’s why! Many photos later I was presented with the same view of a secretary bird, strolling through the grass, looking for her prey and in a split moment she decided to take off. With my camera already trained on her, I was able to track her movement and get the right action shot. Now we’re talking, the subject is still given room to look into the frame, but now we have action and a dramatic sense of motion, not to mention the gazelles in the background to further express that this is Africa. Now the photo functions as a more environmental portrait expressing that these animals share the same space. This is a much better photo. I take a lot of terrible photos initially because I’m not sure if anything better will come along. I take terrible photos like these all the time, but the reason you don’t see them is because I only show my best work. I still want you to take the bad photos but I want you to realize it’s bad right when you shoot it, and expect to take a better one later when presented with the same opportunity. Hopefully the second time around, something magical happens and you are prepared to take the shot because you have a better understanding of what you’re looking for. These photos were taken in the Masai Mara in Kenya while hosting a photographic Safari, if you like this check out the Africa gallery!